April showers bring May flowers. It also brings changing weather patterns that can lead to flooding. Flooding often happens without warning, and standard homeowner’s or renter’s insurance policies don’t cover flooding. If your home becomes flooded, here are some smart steps to take. Remove the muddy mess. Shovel out as much mud as possible, then use a garden sprayer or hose to wash mud from hard surfaces. Clean and disinfect. Every surface must be scrubbed with hot water and a heavy-duty cleaner. Next, disinfect surfaces with 1/4-cup chlorine bleach per gallon of water or with a disinfectant product that’s labeled as a disinfectant to kill germs. Caveat: Chlorine bleach should not be used to disinfect silverware, metal utensils, and pots and pans because it reacts with many metals and causes them to darken. Take it outside. Furniture, rugs, bedding and clothing should be taken outside to dry so the cleanup process can continue. Mattresses, toys and stuffed animals should be thrown away. Upholstered furniture soaks up contaminants from floodwaters and should be cleaned by a professional. Solid-wood furniture can usually be restored unless the damage is severe. Wood-veneer furniture is probably not worth the cost and effort of repair. Photographs, books and important papers can be frozen and cleaned later. Wash off the mud, put the items in plastic bags and place them in a frost-free freezer. Freezing your items will protect them from mildew and further damage until you have time to thaw and clean them or take them to a professional for restoration or repair. Get a move on. Once your possessions are outside, use an air conditioner or dehumidifier to remove moisture from your home, or open windows for ventilation. Vacuum floors, ceilings and walls to remove mildew, then wash the surfaces with disinfectant. Wear a two-strap protective mask so you don’t breathe in mold spores. Pump it out. If your basement is full or nearly full of water, pump out 2 or 3 feet of water each day. Draining water too quickly will cause the pressure outside the walls to be greater than the pressure inside the walls. This pressure change may make the walls and floor crack and collapse. 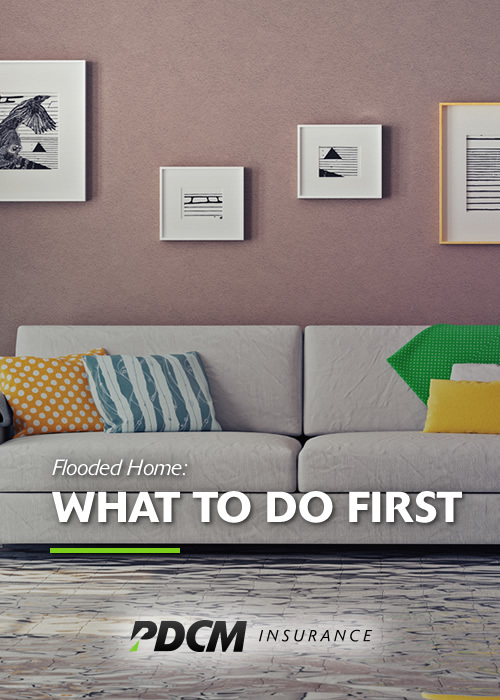 These steps are only a few that can be taken to help you recover from a flood. For a complete list, visit the Flood Safety Education Project. Has your home been flooded? What steps did you take to get your home back to normal? Let us know! April 21, 2016 in Insurance News.